Putting you in command of your own city that you will build from the ground upwards and then expanding to conquer a vast continent, Forge of Empires is a classic free to play city/empire strategy game that can be played through your internet browser. Advancing through the eras from Stone Age and beyond, you can unlock new technologies, build new monuments and raise mighty armies to do battle against your rivals in this game of trade, diplomacy and conquering. Forge of Empires is your typical resource management city constructing game that goes one step further than some of the classics and gives you full access to the layout of your city and making you responsible for placing each building and road. There are a number of different building types, more and more unlocked as you research your way from the Stone Age and beyond, all with different properties and requiring different costs and resources to build them. Needed to increase your populous, from their homesteads you gain earn a constant source of gold currency to keep expanding your city and empire. People act as a resource themselves and more are needed to keep expanding and building new buildings. Used for both resource gathering and some light crafting for the essentials, such as tools. With a workshop built you are able to select what type of resource you wish to gather or what items you wish to construct from it. As you progress you will be able to unlock and create new resources to be used throughout your civilization. You can, and must, line your city with decorative buildings to keep your populous happy. A happy people create an efficient working environment and boost their productivity, let them become unhappy and this productivity soon suffers. Build a barracks to create military units and give rise to a might army, use it to defend your people or raze and conquer rival cities. The technology tree in Forge of Empires is extensive to say the least, hundreds of different technologies to learn starting in the Stone Age and advancing through the different epochs to the Late Middle Ages (though final release they are hoping to go all the way up to a Futuristic Era). By earning and spending Forge Points, that are gained every hour, on research you can unlock a variety of new technologies giving access to new buildings, new units and new boosts for your city and empire. With such an expanded tech tree there are a multitude of different paths a player can take to best suit their own tactics and play style. The continent map will let you scout out new regions and their provinces, to meet with their leaders and open trade negotiations or, if you wish, send your armies to march against them and take their lands for your own. When selecting a province you can see the leader and often the armies that he has access to for defending his land, if not you are able to pay to infiltrate the settlement and see what forces you might be up against. When attacking a new province you can choose which units of your army you wish to fight with, matching them up against the defenders units, and then enter a new map. A hex grid battlemap will appear that is littered with different terrain hexes such as trees, rocks and hills that give different offensive and defensive benefits. Combat is simply about overwhelming with numbers, if a small force is used tactically and the terrain is taken advantage of then they can still defeat a larger opponent. Once all the provinces in a region are conquered you gain free access to the resources it was giving and adding them to your own empires stocks. 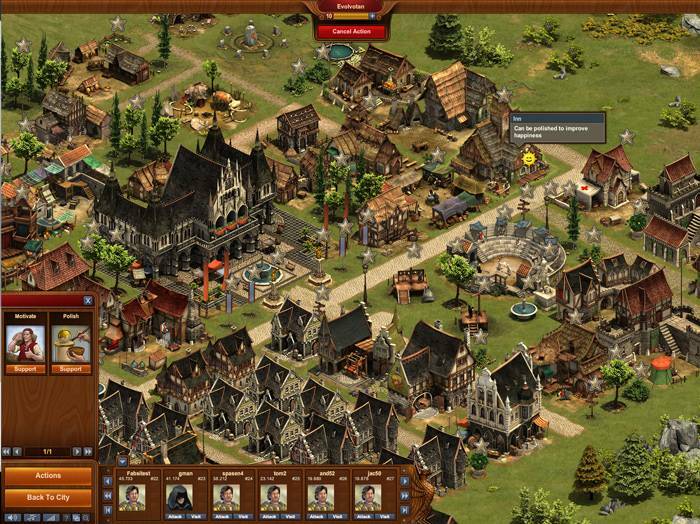 Within game you can have quick access to other player’s cities, including your friends or even guild mates, and with a quick click of their portrait you are instantly transported to their city. Once there you have the option of offering up some help to give their growing city a boost and in turn your good deed is returned back on you in some smaller measure. In Forge of Empires players are able to purchase with real world money “Diamonds”, the games premium currency. With these Diamonds you are able to do virtually anything in the game that would otherwise cost time or extra resources, such as rushing construction or buying Forge Points for research, as well as some exclusive buildings only available with this currency. Looking for more Free MMO Browser-based games,Free MMO management games,Free MMOs games?